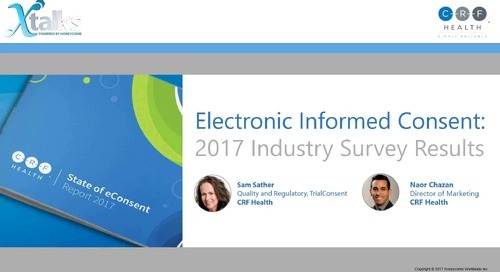 In this webinar, Sandra "SAM" Sather from CRF Health and special guest speaker, Giga Smith from Coastal Carolina Health Care (CCHC), will reveal the results of CRF Health's "Electronic Informed Consent: 2017 Industry Survey Results - Site Edition." This site-specific survey gathered feedback from 105 respondents in roles including study coordinator, clinical research associate (CRA), investigator, and researcher. The input from a site perspective can prevent some major issues when implementing a new technology. 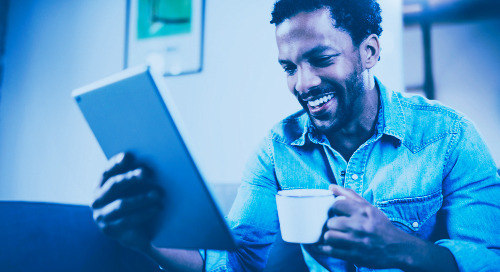 Whether your organization is just starting to consider eConsent or looking to expand adoption, these survey findings will provide valuable insight and context into the perspectives of site staff. Well good day to everyone joining us, and welcome to today’s Xtalks webinar. Today’s talk is entitled Electronic Informed Consent 2017 Industry Survey Results from Clinical Sites. My name is Andrew Jordan, and I’ll be your Xtalks host for today. Now today’s webinar will run for approximately 60 minutes, and this presentation includes a Q&A session with our speakers. This webinar is designed to be interactive. Webinars work best when you’re involved. So please feel free to submit your questions and your comments for our speakers throughout the presentation using the questions chat box, and we’ll try to attend to your questions during the Q&A session. Now this chat box is located on the control panel that’s on the righthand side of your screen. And if you require any assistance, please contact me at any time by sending a message using that chat panel. And at this time, all participants are in a listen-only mode, and please note that this event will be recorded and made available for future download. Now, a big thanks to CRF Health, who helped develop the content for this webinar. CRF Health is the leading provider of patient-centric eSource technology and service solutions for the life sciences industry. With experience in more than 800 trials over 100 languages and across 74 countries, CRF Health’s TrialMax electronic clinical outcome assessment platform consistently demonstrates the industry’s highest data accuracy, patient and site compliance, and patient retention. CRF Health’s eSource solutions improve trial engagement by fitting into the lives of patients and seamlessly integrating into sites to maximize protocol compliance. Now the integrated TrialMax platform includes eCOA solutions for collecting patient-reported outcomes, observer-reported outcomes, clinician- or rater-reported outcomes, and performance outcomes, and features TrialConsent, an intuitive and interactive electronic solution for collecting informed consent in clinical trials. 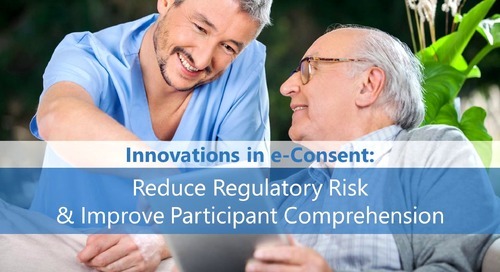 As the only solution offering eConsent and eCOA on a single integrated device, CRF Health’s TrialConsent solution and TrialMax platform promote participant compliance and retention through better comprehension. All right, well now I’d like to introduce you to your speakers for today’s webinar. 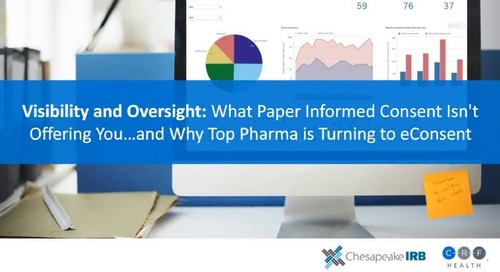 Sam Sather, her current focus of consulting is to promote clinical quality systems for sponsors and CROs, investigators, and clinical research institutions. She has over 30 years of clinical experience, a Bachelor of Science degree in Nursing and a Master of Science degree in Education with a specialization in training and performance improvement. Sam has served many roles in clinical research, including study site coordinator and manager, sponsor and CRO monitor, quality assurance auditor, risk manager, trainer, and performance management consultant. And your second speaker for today, Giga Smith, is the Director of Research for Coastal Carolina Health Care and Research, a large multi-speciality private practice and research site in New Bern, North Carolina, where she was responsible for starting their research program in 2015. Now Giga has worked in clinical research since 1991 in roles such as study coordinator, project manager for CROs and pharmaceutical sponsors, and business development for CROs and patient recruitment providers. As the Executive Director of Research at Greenway Health, Giga also managed studies and sites that utilized technologies to facilitate direct data entry into EDC systems. And now, it’s my pleasure to hand the microphone and the presentation over to your first speaker for day, and that’s Sam Sather. Sam. Thanks so much everybody, and welcome to our presentation. So really, I feel very very grateful for Giga Smith to be with us today to present the site perspective. So what we’re going to do for you guys for the next hour is, first, we’ll start with Giga and myself giving our experience working with electronic consent. And then we’ll go into CRF Health did a site survey earlier in 2017, for research sites’ use of electronic informed consent. So we’re just not going to present the survey results, but also get the site perspective and elaborate more. So Giga is going to be really giving a lot of insight and experience related to how sites have or can work with electronic consent and what might be some pros and cons. And then, to finish the presentation, we thought it would be very valuable for you guys to hear from us about how to integrate eConsent. What would be some things sites really need to have in place and think about. So a crystal ball view, basically. And as was mentioned earlier, we’re going to save time for some question and answer. So thanks, Sam, and I want to thank CRF Health for inviting me to participate today and give some of my input based on my experience and my sites’ experience. So, what is eConsent? E-Consent refers to the use of electronic systems and processes that may employ multiple electronic media to convey information related to the study and to obtain and document informed consent. 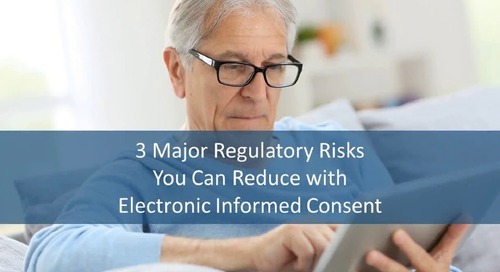 So multimedia in electronic informed consent can include things like text, graphics, audio, video, podcast, passive and interactive websites, biological recognition devices, and things like card readers. So for both sites and sponsors, we’re so accustomed to using paper informed consent forms that we don’t even realize that other forms of media can be used to assist the study patients to gain a more full understanding of the study and of the content of the informed consent itself. So my experience with eConsent of course, I’ve been doing studies for many many years, and the vast majority of course still are done in paper. But we started out at my site, we had a very large Phase IV study, we enrolled at my site alone 250 patients and we were using eConsent. We did a Phase III respiratory study, it was a very complex study and a complex informed consent form. It was an interventional study and we had 13 patients that were involved. Currently we’re participating in a Phase III rheumatoid arthritis study, it’s interventional, and we’re using informed eConsents for that study. And then in a prior role, I worked with a technology company that assisted with an 80-site study where patients were invited to enrol in a registry study and it was via a letter that was sent to the patient from their doctor, and they consented online. And for my experience with eConsent, I remember the first study I monitored where eConsent was part of the study design. And it was interesting, the study was US only, which tends to be quite common because of the acceptance of FDA versus outside the US. And at first, the sites had a choice to either use the eConsent or not. So the first time something went wrong, they aborted and went to paper. So good lessons learned is, how do you roll it out and what kind of support. So then another study I was able to do some monitoring for the eConsent study. But I’ve also been a subject matter expert for CRF Health actually for quality and regulations related to consent for about two years, so how do we marry GCP and technology development patient facing. And then I have a master’s degree in adult learning, how do people learn. And it is kind of interesting, when we had paper for a long time, how it’s not really the best way people learn by seeing a bunch of text. So we’ll talk more about that as we move through this presentation. So kind of a nice background. We’ve got, again, from the monitor’s side, and also definitely the site’s experience and we wanted to start with giving you a background on what is really—what was our survey that we did, what was kind of the respondents’—who answered, in other words. Let me set the stage for what the CRF Health survey from earlier this year. So when we did our survey, we did survey sites, sponsors, IRBs, internationally. We had 105 respondents in roles from the site level, CRA—site being site coordinators and investigators—and other kinds of researchers as well. And then therapeutic areas, it was really nice, it was broad range: 15 different therapeutic areas. And the experience level, more than half—actually much more than half, about 67%—had at least three years’ experience working in clinical research or GCP. Now, the locations of the respondents, very much US, 89%. And we had some Canada and some UK. So we’d like to do a survey where we get more outside the US for sure. And then, where were they sitting, what locations. So academic medical centers were the biggest responders, about 39%, or from university, definitely where they’re doing managed care. So that’s an important point, where they’re not an independent research center that does only research. But that was our second-largest population, those that worked in research settings. So then the majority of site respondents, we had some sponsor respondents, mostly US, a lot of academia, lot of medical center managed care, and also independent. Now when it comes to the usage of eConsent, this is not a surprise. So respondents said that less—over the lifetime of doing research, about a little more than 10% had actually used eConsent in around ten studies. So eConsent’s been around in the marketplace around 15 years, only has gotten real popularity in the last couple years. So, like a lot of technology adaption, it takes a while for that for sure, and sometimes the US takes the lead. But 89% hadn’t really used eConsent very much, if at all. So according to the results of this survey, it does seem that eConsent seems to be gaining greater acceptance and adoption by sites. The majority of respondents believe that eConsent would be useful in enrolment. And 61% believe that eConsent will allow them to consent more participants into a trial. Although we realize that sites today have far more experience in general with paper informed consent forms, I’d agree even with my limited experience that eConsent that they’re a valuable tool, useful method of consenting patients. And in particularly, we use them with that large study that I referred to, of about 250 patients, and I'm sure that had we had to use paper with that, we probably would have only enrolled about half that number. You know, the other thing about the statistic on this previous slide is, other surveys that are out there that you can find that look at sites, like Applied Clinical Trials did some looking at sites’ acceptance, very similar results as our survey. So the use is not high but definitely the understanding that it could help the sites and/or the participants. And in some of these ways are the common ways that we see those that have used eConsent say that are some of the key features. And we’ll talk more about those coming up in the presentation. But, you know, reminding patients, giving someone an electronic copy, something that they can actually find on their computer when people are used to technology, using pictures, text, tables, and graphs, etc. So we’ll talk more about this in another section. But it’s not just unique to our survey, is the main point here. From the results of the survey, site feedback and their perspectives, we’ve put into three categories the challenges of using paper informed consent forms. So the three main challenges that respondents agreed upon were length, content, and process. It’s really difficult to think that the size of these paper informed consent forms that we’re handing over to patients, that can be 20 or 30 pages, but we’re obligated still to include the 20 or so categories of information that must be in informed consent. The content is supposed to be written at an 8th grade level. But I find that as trials become more and more complicated, the language and the content does as well. The process of the site having to locate the correct informed consent version, obtaining signatures, initialling in the correct places, copying and filing, it takes about an hour, and it can be very subject to errors. It sounds very simple, but it really is not that simple. And that’s why, as we know as researchers, we have monitors, CRAs, that have to go out to sites, just to view the informed consent forms, to make sure that everything is filled out completely. And a big advantage that I can see is that with eConsent, these can be viewed remotely, where a CRA does not have to travel to the site. So sites are reporting that the average consent form is between 16 and 30 pages. I have to agree, I have not seen a consent form that’s less than 25 pages, even for a Phase III study. And that’s even outside of oncology, and they can even be longer. The process of consenting patients with paper requires that the site staff is really careful when using the right version of the paper informed consent form, and not get hold of a previous version. We’re finding that sponsors are frequently changing the ICF versions because of amendments. So great care has to be taken to properly re-consent patients if it’s indicated. And when you’re sitting there with a patient, flipping through paper, when you’re consenting them, pages can get misplaced. And there are multiple signatures that are required on these forms. You can have an audit finding, if you’re making a copy and there’s a page missing. It’s a lot of space that’s taken up when filing informed consent forms in paper form. And patients themselves are carrying around these large documents. They can lose the document. They can lose or misplace some of the pages. So having an electronic copy, it can be emailed to them, you can always reprint that signed copy. So you can always have it on hand, the patient can always have it on hand. So the burden of paper is really lessened on both the part of the site and the participants. And when it comes to how long it takes to consent a participant, about half of our respondents said anywhere between 30 minutes to an hour. So think about, you know, 30 pages, 20 pages, however much it is, the time spent with the participant is really important. And then also, some of our respondents, about 30%, said that it takes longer than an hour. And I imagine, again as Giga said, with these very complex studies. So thinking about the time to complete a consent form, that when you’ve got an oncology study, something where someone needs more time, so it might be in several sessions as well. And so when I think about the time and the credit that a site could get for completing this, a lot of times the documentation may not really show that. So it might in a process note, or a progress note in a subject’s research chart, seem pretty a moment in time, but many times it’s really over visits and over a lot of period of time with the site and and at the site. And then, in the idea of focusing on eConsent, we kind of talked about the length and the complexity and the time that it takes. And the focus really, we really want this to be patient centric and supporting our patients. And with the time that the sites take with the patient, wouldn’t it be great if there was better support for the sites to present this information. And also, how do we really show documentation-wise and also facilitate and help the site feel that the participant or their LAR has this understanding of what they’re agreeing to and also could they commit to what might be big procedures coming up. So recruitment, retention, those kinds of things. So I wanted to give the Giga the floor to talk about how the length and time and structure of a consent, what about eConsent, in her opinion and her experience and working with a lot of patients, what does she feel about this. So you know, basically we still have to have this content in informed consent. And if I look at the use of multimedia, tables and graphs, and I’ve seen one eConsent that we didn’t actually use on the study but it had little stick people in sort of a cartoon, and so I see these things as being able to provide a means of helping patients better understand these forms. We’ve found as far as using the tablet, that even elderly subjects were very comfortable holding and using the tablet and scrolling through the pages with very little instruction needed, and that really surprised me. But patients are so used to tablets and phones that they’re using all day. 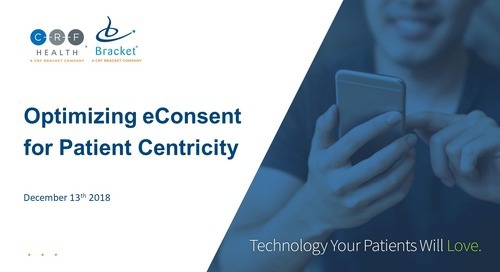 One of the things that we do during the informed consent process is that we tell patients, when using an eConsent, that we can actually see how long they spent on each page. And this will come out on that audit trail that’s provided. And then, you know, we’re obligated to make sure that they really read it and that they understood each part of the consent. So by telling them that we can see how long they spent, we find that they don’t cheat, whereas with paper they can kind of flip through the pages. But you can see exactly how long they spent reading each page. There are patients that say they’re sure they want to enrol in the study and they don’t think they need to read the entire form. But the eConsent helps us to better track and make sure that we’re explaining to the patient, and again, it shows that they spent time on each page, they can mark directly on the tablet where they had questions, so as a site, we can feel more assured that they are really prepared to give their consent. Great, thank you. And the next section, besides the length and how we present it, by the regulations it’s required that patients have time to have their questions answered. So the participants or the LAR or the parents, whoever might be involved. So we asked in our survey, what is the average amount of time that’s spent with participants in answering their questions and what kind of questions and such. So you can see that there’s about 15-30 minutes that on average, at least for our survey, that’s spent on this area. When you look at source documentation though at the site, you can’t really tell really what kind of questions, and also you might have a brief statement that questions were discussed. So not a lot of meat and potatoes, I guess you could say, there. And then, again, the paper informed consent doesn’t really allow the participant to mark—you know, we don’t want them to mark on the consent that they sign, so could a system help support this, is one section that we looked at in our survey. And in this area, Giga, you’ve got some other things you wanted to say here, too, right, about these questions? Yeah. So the survey pointed out the most commonly asked questions by participants, which are listed here, and I think they’ll probably be pretty familiar to everybody. And I’d agree, although I think your average patient, after reading the long paper form, they might forget by the end of that that the purpose of the study by the time they reach the end of that long consent. And there’s something called knowledge checks inside of an eConsent, where a question can come up in the consent, and it can ask the patient a question. So it’s a check there to see whether they’re really understanding. So I think the use of knowledge checks has been really useful in helping us to be assured that the patient is understanding what they’re reading. It’s not a good thing if participants are reading consents and they don’t ask questions, or they ask too few, because this can be a sign that there’s limited understanding or even limited interest on their part. The person that is doing the informed consent of course as part of the process we’re obligated to ask the subject questions to assess their understanding. And if the consent was read through, and they ask questions, then this helps us to understand and realize the patient’s engagement level, if they were engaged or perhaps they were not very engaged, and as far as the informed consent process, we have to document that we answer all of their questions. But I know what we do not do as a site is, we document all questions were answered, but we do not tend to look at exactly and document exactly where they had questions on the form. And I think that’s a really key benefit of eConsent, because we can get that data and we can know exactly where patients or multiple patients might be getting hung up on the same part of an informed consent form. So maybe that’s something that can be improved upon. And then the audit trail that gets printed off is really helpful in providing all of this documentation, so it’s less hand writing of the process that we have to do on the part of the site. And one thing I thought maybe we could discuss a little bit more here is, for those in the audience that haven’t used eConsent before, there’s some different source documentation that these systems provide. And you just mentioned the key word that people hear a lot about and we kind of use this term “audit trail,” sometimes it’s called a journal. Can you describe what you’ve seen as some of the source documentation that a site would be provided typically for eConsent? So it is a printout, like a log of the time, the duration, that is spent on a page. And it will note each place where the patient has indicated that they had a question. And then, after that question is answered, you can hit that that question has been fully understood by the patient.These are things that we’re normally doing by hand. So, you know, the time, even just the total time spent on this audit trail, it’s just something that we can print off and put in and have as part of our source documentation. And I think what’s great about it is that if this is used, if multiple people are consenting patients for the same study, that documentation is consistent throughout. Everybody isn’t doing it their own way. So consistency is really key. So as far as participant dropouts during the informed consent process, the survey states that between 5 and 25% of patients may drop out. During the informed consent discussion, I always think it’s a really good opportunity for the site to select good study patients that are appropriate for that study. So dropouts during the informed consent process are not necessarily a bad thing. It can mean that they dropped out because they were not engaged in the study, it was not for them, and they may not have turned out to be compliant study patients. So what we don’t want to do is make subjects feel overwhelmed by the content. Handing them a 20- or 25-page book to read can be overwhelming. And we find, as study coordinators, some subjects are immediately turned off by that. It looks like this huge contract that you use when you purchase a house. And no one ever really reads the fine print. So we just want them to be less overwhelmed by the content and help them make an informed decision. And I think that maybe some more use of tables and graphs and things that visually really speak to patients can be helpful there. Our site feels that handing them the large paper document feels very outdated, it’s not current. I believe when you buy a house now I think it’s electronic as well, the contracts. Clinical trials really shouldn’t, I think, give the appearance that they’re behind the times, because most of the studies that we use at our site that we participate in, most of them use eDiaries, so the patients are using an eDiary, they’re using the tablets for electronic questionnaires. So I think that shouldn’t the informed consent be electronic as well. They’re going to probably with a lot of our studies they end up signing multiple copies because of new safety information, new versions of the informed consent and amendments, so I just really think we’re using electronic devices with patients so why shouldn’t the informed consent be electronic as well. And you know it’s interesting as we go into the part of the presentation where were talking about during that time of consent when people decide yes or no and as you just said of course we want them to have their right to say no. But having more information, the right information in how it’s presented. So we looked in the survey and we asked the respondents what are the top reasons they feel that someone refused to consent during a consenting process, so they’re not on the trial yet. And some of it is definitely related to the information that they’re getting, or they decided to participate elsewhere. So some of these are things that they had issues with protocol. You know, sometimes sites write down maybe why the participant said no in a consenting progress note, sometimes it’s not there. So the systems would offer the patient a question when they say they want to stop consenting, and if they wish to get the answer we could get some more metadata and maybe improve our consents or learn more about our protocols. And then, when we think about recruitment, our respondents felt that if we had better information in the consent forms, it does impact somebody saying yes or no. And some of the respondents actually felt that they didn’t get enough information, even with 30 pages. But we do know that a lot of times the document is full of legalese and content. So as Giga said, there’s certain things by law we have to have in the consent, but how it’s laid out and how it flows could very much facilitate and what is the most important stuff that you want them to know related to their safety is that what’s ringing and, you know, what’s really right there when they’re making their decision or is it a lot of legalese. So our respondents feel if we present it a little bit differently or the right kind of information for sure. So Giga, any other thing about recruitment that you wanted to chime in here? So I think always knowing that you’ve got a potential subject that comes in and you can grab the tablet and you’ve got the right version of the consent form on there, I think it’s just helpful. I think that whatever is helpful to the site staff in conducting the process, this is going to leave more time for the actual discussions with potential patients. So basically what helps the site staff in turn can end up helping the participants, and what helps the participants help the site staff. Yes, a great point. I do think this is a tool to help those that really a huge job to present a consent and support the patient. So great point there. And another section that we went into in our survey was related to, say somebody’s consented, they’re on a trial, and can eConsent impact the retention of somebody on a study. So we do know that since this is fairly new use within the industry, we do need to keep collecting statistics on this, we asked our respondents, what’s the main reason that people drop out of the study. And these are no surprises. So the expected ones that maybe can be improved through eConsent, like for example, misunderstanding expectations. If it’s inconvenient location I would hope hat they should have understood that in their initial review of the consenting. But number one was lack of understanding. They dropped out because they didn’t understand. So we do know that that’s impacting folks staying on our study. So our respondents also indicated that reminders to participants during the trial and an ability to keep asking questions and actually this being something that is solicited to them. So could a technology also be giving them reminders, and also giving them the ability, so you’ve got your next visit coming up, any questions? So better supporting this concept of continuous consent. Some other things that we found that our respondents say that impact how somebody stays on a study. Some of them we’ve already mentioned like reminders to the participants, is video. So 29% of our participants thought this was a very very important thing, that videos could help. Pictures, so the multimedia thing was very helpful. Being able to re-consent or consent remotely, the convenience of not having to come all the way back into the site. So this is, again, in your handout you’ll see that this is some of the other reasons for significant impact, medium impact, or none. So the most impacting is at the top, the ones that we mentioned about reminders and the ability to ask questions throughout the study. Now, as we come to finishing this section about recruitment, Giga, anything else related to retaining somebody on the study, that you think eConsent can help? So I would say that eConsents are supporting the staff to do a better job informing the patient. They’re less likely to drop out later if they have a good understanding of what to expect during the informed consent. And if consenting is a better experience for patients, then maybe retention is going to be better, because we’ve got a more engaged and prepared patient. So basically like you said, moving forward we’ll be getting some more information on whether—how eConsenting impacts retention. But I think it just goes back to the ease of using it. And having them drop out if they’re going, if the the study is not right for them, during the informed consent process and not later on. Good point. So we’ve finished presenting the main survey findings, and then discussing things like the length, the question and answer facilitation, the recruitment and retention, so these are the main categories we just covered related to eConsent sites. So the last part, we promised that we would discuss from an operational viewpoint, how does eConsent use an integration of electronic system in such a pivotal process impact sites and what are some key areas they should think about and those that work with sites you really making sure for success these are things that are pivotal. And they really fall into three main categories we thought as we were planning this presentation. And Giga’s going to speak to all three of these. So how does this impact study site procedures? How does this impact the current processes that they do to obtain consent, re-consent, and really the quality control? And then, you know, you don’t get credit for anything unless it’s documented, so how does this impact the documentation? So, Giga, go for it, let’s talk about these things. So I really feel that eConsent is here to stay, and I don’t see any reason personally why we should continue with paper. I remember years ago, when EDC first came around, and it was difficult and we kind of wished it would go away. But here we are and EDC is certainly the answer. We found that the required documentation about the informed consent process has been way easier because of that audit trail. We’ve worked with multiple eConsent providers, and as far as the training goes, we as a site did not feel that that was burdensome at all, really. What we did find that was challenging is, the eConsent systems that we used, two of them we feel were not fully beta-tested. For two of the studies that we participated in, my site was the first site to enrol patients, and we found ourselves on the phone on a daily basis with the eConsent help desk, pointing out things that were not working as planned. So eventually things were worked out, but beta-testing should be thoroughly completely prior to the first site being initiated. So beta-testing as far as the procedure, site training, which is easy. And so if this is all really nailed down, it’s just going to help avoid frustration on the site’s part. And also you don’t want to take up any more of the patient’s time, not being able to go through the eConsent quickly. So as far as the process, we’re a central IRB site. So we found it very convenient that the most recent version of the consents were already loaded onto the tablet. This is a relatively new process still, so we’re always going to—at least for a while—feel that we need to double check the IRB portal to be sure that what is on the tablet is the most current version. From our site’s perspective, I think it makes sense to move towards electronic filing of all signed informed consents. I personally do not see the necessity of keeping around all of that paper. It’s subject to loss, whereas if it’s an electronic form you can at least get at it. Archiving paper and space is always an issue, and again an e-copy is always accessible. As far as scheduling patients, I know a lot of sites like to email copies of the informed consent to patients. So if you can email them a copy of the eConsent and what it looks like exactly, whether it contains video or graphics, that can be really helpful to somebody who is reviewing an informed consent prior to coming to the clinic for their first visit and to consent. Our practice is a very large busy office practice, and our preferred method of engaging a potential study subject is when they’re in our office for their regular office visits. So we discuss the study with them on that day, and they may end up signing the consent form or taking it home to review further, it’s easier to just like I said grab a tablet rather than locating the paper forms or have to maybe make copies again, and then this helps the patient because it helps get them out of the office faster because they may not have planned on being approached by the study coordinator to talk about a study and to read and sign a consent form that day. What’s key with eConsent I think is that again we don’t have to worry about missing pages because it happens. and if any of the multiple signature lines, the initially that is required, if any of those are missing, the tablet will not let you finalize the consent. So this is really helpful in limiting errors on the part of the person that is conducting the informed consent. And again, the audit trail, it’s printed off, and it leaves us more time with the participants and then less time documenting that process. To finish off the presentation, unless you have anything else to say, Giga, about the documentation practice, we wanted to give our crystal ball, what we think eConsent’s impact on clinical trials in the future, and especially at sites. So Giga, go for it. So just the ease of administration—less paper, less filing, less storage, more flipping through paper—presenting something that’s new and current to patients in a tablet, the remote access for monitors I think would be key. And then, just a better understanding on the part of the patient, and knowing that we have a more informed and engaged patient. Great, and I would just chime in, patient centric like you said, absolutely. You know, you already mentioned less compliance issues. I have just a question I think the audience would be very interested in. Any words of wisdom, you talked about beta-testing, so make sure, you know, there may be issues, the kinks weren’t all fixed when you guys went live from the sponsor or vendor. So any other things or words of wisdom that you wanted to give sites. We’ve given a lot of pros because there are a lot of pros, but any other things that might be on the con side, or side of be careful site, you know, make sure that you do this. So one other thing that comes to mind would be the use of the wireless. So again, I think it would be great if there were more practice sessions, like maybe putting in a dummy patient. And maybe this is something that the vendor helps. Because you don’t want to do this and pull it up and find out that there’s an issue with the wireless transmission. Some of the tablets that we’ve used in the past—and this is several years ago—the battery life was not good, and then we opened up the tablet, you know, we needed to charge it and then you have the patient there waiting. So I don’t necessarily think that these are really difficult challenges to overcome, but the most frustrating one was definitely the lack of something being fully beta-tested because it was a lot of our time helping the eConsent vendor. But I don’t think that any of these challenges are particularly difficult to overcome. Great. Thank you for that. So we’re going to go towards our Q&A, question and answer time. I just have one thing I want to present on behalf of CRF Health for TrialConsent, the name of their solution for eConsent. So just in brief, it contains three different tools as part of the system platform. And one is a designer, which is where the consent is created, and in a future release it could be created in a collaborative scope, where you can have those that actually have to review the drafts come and work together in one space. And then, it being also the space where the IRBs can review and see exactly what the patient would see, and generation of a PDF copy as well, so you don’t have to start with a paper copy, eventually. Just like eCOA, ePRO, and eCRFs, paper as Giga was saying, please let’s go away from paper. Wouldn’t it be nice also in a draft world not have it. And then because it is a web-based system, all the tools are—the participant really could be consented on many different kinds of devices. And here we just show a tablet. The other thing is the oversight of consent, so tracking who’s been consented, the reasons why they stopped consent, how long did somebody spend on the consent. So study data, site data, and subject-specific data in the TrialManager, the one over on the righthand side. So different kinds of user rights and limitations of what you can see based on your role. So all the security, Part 11, and HIPAA compliance. And just the last thing is, you know, CRF Health this eConsent is new for us but it’s not a new technology, so it’s based on a platform that’s been used for eCOA, ePRO for 15 years, plus. So let’s start doing this Q&A stuff. I know we’ve got some questions that have come in. That’s right, we certainly do have a good volume of questions coming in here from the audience, so thank you for that. And thank you for your presentation. Lots of useful information presented there. So if you do have questions for our speakers, Sam and Giga, right now you can use that questions and comments chat box, on your control panel to write in your questions. So of course, we’ve got a number of questions here, let’s get started. Is it possible to have questions asked directly to the patient in order to check that they understand each section, like a test integrated into the consent? Yeah, they can be embedded right into the consent form. So that’s what I referred to as knowledge checks and I think those are really helpful. In fact those are all IRB approved of course. And they typically tend to be the things that you want them most to walk away with. The other thing that’s important to remember is, sometimes people guess and they might get it right. So in some systems—at least I can speak for our system—it reviews all the questions at the end. There’s a review session that has to happen in the system before the signatures can happen, because if you ask these knowledge checks, I imagine they’re ones that you want to make sure they’re discussion points as well. Do you think that the eConsent led to recruiting patients who understand better what they’re stepping into and therefore are more susceptible to remain in the study and not to stop before there end of the trial? So I would agree, yes, because if there is a better understanding of what they’re going to be going through, the different visits, they can better make a decision that day rather than be a lost followup or not being able to retain them. So better understanding of the study and their expectations as a study participant, I would definitely agree that we’re going to see fewer dropouts. Great, good to know. Thanks for that as well. 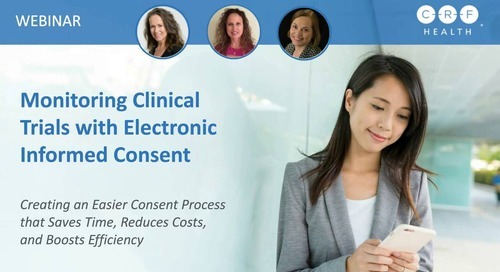 What are some of the key factors for eConsent implementation? Sam, do you want to take that one? Sure. So a couple of things, depends on stakeholders, since we’re talking about sites, is logistically you could look at it from the technology standpoint of how would you schedule patients, would you be providing anything remotely to them, to review maybe before they came in. What are the local laws, so the regulatory side. And the other thing is, as early as possible, involving the ethics committees. So Giga’s sites worked with central IRBs, and in the United States I’ve not talked to a central IRB who hasn’t had experience with eConsent. So in the United States it’s very unique. And I would say even local IRBs have had quite a bit of experience with eConsent, “quite a bit” meaning ten studies a year. And that’s increasing because things are getting more popular. So thinking about how it would impact scheduling, documentation, interactions with other stakeholders like ethics committees. And you know, I always think about, how is this going to impact me, I think about the systems that you have in place to do your trials. So would we have to document differently, would we have to train different, would we have to change our procedures, would we have to do any quality control or quality assurance different. So those are the six categories that I always kind of drop into. And Giga talked to quite a few of those in that last section. In your opinion, what are the needs of a good eConsent platform? Giga you want to hit it, or we can both do it? The platforms, so I think that’s you, Sam. You know, one thing I wanted to say is, to sites, sometimes the word “platform,” what is a platform to a site. You’re not a technology person. So what would you want the solution, the system, to do for you. So Giga mentioned a few things. One, you want it to work. So you want to make sure it’s beta-tested. So I love her suggestion about practice sessions, dummy patients. And I imagine during the investigator meetings, etc. it’s done, but you really need to do it at the location where the patients are going to be seen, I would say. And then, find out what are your things that you need to work out. Because you know, this is—there are commonly will be where you’ve got to work all together, and Giga again when I first started working with her, it was really great on how their site was patient with the vendor and the sponsor and didn’t run away if one thing didn’t work one day. The other thing that a platform needs to have by regulation—and FDA has a great guidance document out there that Giga read the definition of eConsent earlier—is that in case the patient doesn’t want to do this in the tablet, there has to be a backup paper. You don’t have to do paper in parallel—there’s lots of myths in eConsent development and deployment and use—so you don’t have to do both. So it’s not like they can sign eConsent and you have to have them sign paper, unless that’s a regulation or local requirement someplace else but not FDA for sure. So the other thing is, if say for some reason there is a system failure, or outage for something, you have to have that backup. So those are some really important things. And the platform, PHI, another thing, you don’t want—if Giga’s site allows a sponsor to see protected health information without the patient’s permission, that’s a breach. So it’s making sure that there is this protection. And not that monitors couldn’t see PHI, it’s how it’s arranged, you have to really thing about what’s going to work for remote monitoring and who’s responsibility is it to protect the privacy of the patient. And so the site needs to have a say to that, they need to agree that what the system does meets their standards because they’re the ones, in the United States at least, that get this information not the sponsor. I could go on and on but we want more questions. Well we certainly have those here. So let’s move on to another question. Thanks for that. How are the eConsents submitted to the IRB or IEC? Is it done through an e-version of the document itself, or do you need to get a paper transcript of the document? What did you see, Giga? So you can still, on your IRB website you’re still going to see the printed version. And all I can say is that that part of the process, we didn’t have to worry about that, as a central site. That was done between the sponsor or CRO and the vendor. We approved the content in a paper version, and any changes we wanted to make. And so that part of it is no different. And then, you know, on the tablet, there comes up the approved version. So to us as a site, it was seamless. Great. And just to fill in a few blanks that happened prior to the site level, think of the layers of consent, global, and then you know the global template that a sponsor might have, and then the local, regional kind of requirements, country-specific. And then you get to the site level. So it’s quite complex. If you think about how many versions of a consent you have going on in an electronic world, it’s pretty daunting. So you have to have a really good system that manages that. And so an IRB commonly is going to want to see what the patient sees. But they also want to know what’s the difference between the paper and the other. So again, right now in the world of eConsent there’s a lot of paper that’s still happens in the beginning. And we really feel eventually there will be less and less, because these systems will store content that’s used again and again. So I like Giga’s point about central IRB doing so much for the sites. The system has to be able to facilitate site-specific content. So if that central is overseeing 100 sites on a 200-site study, that each site has a little bit unique content in there, so the system has to support that we’re not getting just the country-specific version. Do you have any experience using eConsent for subjects with limited cognitive ability or visual impairment issues, or maybe even illiterate subjects? So your thoughts quickly on that to close out the Q&A. So I know that, I have never used one, but you can get an audio version of the consent, and that would be very helpful, because you’d have to have somebody read the consent to a patient, if a particular study does allow illiterate individuals to enrol—some don’t. And then also, changing the font, making it bigger, to be able to help somebody. I have personally never used it with anybody with cognitive impairment. We usually have the LAR at my site. We do some dementia studies, and so we have an LAR that is consenting rather than the subject. So the system would have to support the different types of people that are participating in the consenting process, like a legal authorized representative, the LAR, impartial witness if it’s something where anything has to be still read aloud. The audio key thing can of course help somebody who’s blind or illiterate. But often the tablet, the FDA’s guidance says that the site can help facilitate that, if you have somebody who is having difficulty because of maybe shaking hands. Maybe they’re fine in the head, you know, their cognitive ability is fine, it’s just they don’t have the ability to hold something or say something or touch a screen. So that facilitation just like in paper is still allowed in eConsent. So great question. Right. Well, thank you very much for those answers. We have reached the end of the question and answer portion of this webinar, but if you do have any additional questions, you have the email addresses there for you, showing on your screen, for Giga and Sam. And also, you can email those questions to webinars@crfhealth.com and I encourage you to do so. Of course there are lots of questions that we had come in today. If we weren’t able to attend to those questions, the team at CRF Health may try to follow up with those questions after the webinar. So thank you everyone for participating in today’s conference. You’ll be receiving a follow-up email from Xtalks with access to the recorded archive for this event. And a survey window will be popping up on your screen shortly. That’ll help us to improve our further webinars if you fill that out for us. So I’m just about to send you a link in your chat box: you can say thanks to our speakers, using that link on Twitter, so I encourage you to do that. Thank you very much, Giga and Sam. Great presentation, great Q&A as well. We hope that you all found this webinar informative today. Have a great day everyone.